I'll try to address some of the issues Havoc presented. Of course, I'm a Mono developer, so I'm biased, but hopefully people can see my arguments are more on the technical side than advocacy. No rewrites please: this is a very important point: we can't just throw away the current code: we need incremental changes to not disrupt stability and compatibility. I'll just note that using Mono (and C#), interoperability with existing C code is much easier than with Java because of P/Invoke. Calling managed code from C/C++: Havoc says it's hard, but Mono provides an easy to use interface to do that. Mono is designed to be embedded in existing applications, not just as a runtime for standalone completely managed programs. Also, it would be easy to create a shared library and header files to access managed methods seamlessly: they can be automatically generated thanks to the use of Reflection and the Mono embedding API. I'm not sure a "simple native component system bridge" would solve the issues, mostly because simple systems are always found later to be incomplete, they get changed and become big, but with all the design warts needed to make a simple design work for not-so-simple constraints. A minimal Mono system is currently about 2 MB on disk, but no effort yet has been put into reducing it (and I think it's entirely possible, we have been busy implementing features and leaving aside space optimizations). Of course, since the default build of the core assembly has lots of features, much of the reduction in size could be achieved by trimming features that other systems don't have:-). Even without trimming, most people will concour that 2 megabytes of disk space for a shared component is small enough in a desktop setting (and applications compiled to IL code are usually much smaller than comparable C apps anyway). Community should decide: of course, I agree. Anything that is pushed down our throats by somebody else is not going to work for the free software and open source communities. The solution will need to be choosen because it actually solves issues the developers and the users see. Java had several years to try to attract developers from our community and it had some success in some niche areas (not for desktop applications, though). Mono has just started, but from the comments of the developers that actually used it to write new applications or port existing ones from C, it looks like we are on a good adoption path (even though we didn't release a 1.0 version yet, we are still working on debugging support and documentation is sparse). Havoc fears the adoption of Mono or Java for the desktop would alienate people and cause forks. I don't think that will happen with Mono, because Gnome will continue to have a diversity of developers who'll prefer using the C libraries directly: Mono allows to keep and interoperate with existing code very easily and we want the migration to happen incrementally, so at first only end-user applications would be written in managed code, while the foundation would still be in C (at least, enough of the foundation to have people happyly writing their own apps in c or with the existing bindings). At that point, when a managed execution environment has proven itself to both developers and users (hopefully) we could start discussing about using it for the foundation, too, if that makes sense. I think Mono is positioned better here to allow this incremental shift of both development and espectations towards a managed runtime. Problems with a .Net clone: Havoc claims that MS controls the platform because, even if the core is unencumbered, some assemblies are tied to MS technologies and there is non standards body or community momentum to build alternative solutions for a complete platform. Well, considering that until a couple of months ago there were 5 people developing mono, we have achieved a lot, not only in the implementation of the runtime, but also, thanks to the large community contributions, in other areas, such as Gtk#, database connectivity, security. There is already a large body of code that is completely independent from the MS stuff. Besides, I don't see anywhere an assurance that Java and all the libraries included with it are unencombered, so this is not an argument that applies to mono only. Sun likely has several Java and JVM-related patents, so a free software implementation of Java is no less a possible target for patent lawsuits than Mono (and probbaly more so, since the companies that submitted the CLR and C# ECMA standard agreed to license the patents needed to implement the technology on a RAND basis and additionaly royalty-free: AFAIK Sun didn't do any of that). Sun went to court to defend Java's purity: will it also go after free software implementations of it if they want to innovate and diverge from the spec? Anyway, as an example: MS have their own Java-on-.Net compiler and runtime system. Mono didn't implement that and uses instead the excellent IKVM.NET free software JVM implementation to run Java code. Innovation: It should also be noted that we (as in Mono developers) are very open to input from the community about changes to the runtime and base class libraries that could be needed to better support new features, independently from what the MS runtime does (the topic came up, for example, about supporting dynamic languages on Mono). Of course, the programs wouldn't run unchanged on the MS runtime, but we can't have it both ways: if we have to innovate we'll be the first to be able to run such programs and maybe later MS will adopt the same technology:-) The only consideration is just this: not breaking gratuitously the compatibility, because that always has its cost. Most of these changes can simply happen in the same way gcc introduced extensions to the C language: first just gcc users could use them, later some were adopted by C99. Of course, since we've been busy implementing the base platform, we didn't have much time to propose and implement innovative changes, but expect changes in the next few months (hopefully also from the community involvement). There is no need for us to just wait for MS to implement something and then to re-implement it as free software. We welcome your contributions in enhancing Mono in ways that can benefit the free software community. We should also consider that ECMA standardizes existing practices (hey, where did I hear "Show me the code!" last time? Yep, in the free software community): we're willing to assist people in implementing prototypes of innovative changes in the CLR using Mono as a base and submit them to ECMA for consideration. Havoc notes that ECMA defines only a subset of the .Net platform and that it maybe too controlled by MS. Even if MS would try to undermine the changes we'd submit to ECMA for consideration, this doesn't mean we can't have our own, community-driven standards effort for enhancements to Mono and for the development of independentclass libraries. Let's discuss how can we best build a standardization effort. 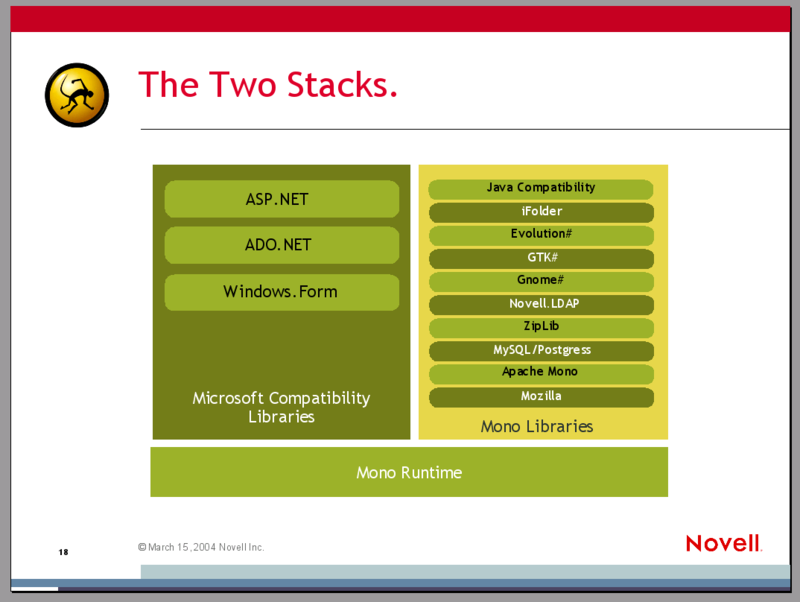 In Mono there are two different stacks of code: the MS-compatible ones and the free software/community one. See the picture. Free software people can just ignore the MS-compatible bits and let the developers who want to port their code from Windows to Unix systems worry about that. Spelling out the options: I'll just note here that one of the options is simply to use Mono and allow people who prefer the Java langauge to use IKVM as a bridge: this may be the best of both worlds. A free software foundation that doesn't exclude (choosing Java would exclude C#, since there is no way to run C# code in Java or any of the other languages that target, or will target, the CLR). Havoc claims that "Anything which is defined as a .Net clone appears to not be viable", because it would speedup the adoption of MS technology. I think that for people who develop for the MS platforms what Gnome will choose is largely irrelevant. Besides, Mono enabled people to jump from the MS platforms to the free software and open source community. So far it has been a win for us, judging by the contributions we had to Mono from formerly MS-only-oriented developers. Anyway, the solution to that is simple: just don't call Mono a .Net clone:-) Mono is open to input from the community for enhancements: if differentiating mono gives benefits to the community adoption and to Mono as a development platform, I'm all for it (just let's not break compatibility gratuitously). Havoc says: the open source Java subset is something we could start using today,that nobody has any fundamental reason to reject. Well, using Java as the foundation has issues, the first of which is that it doesn't easily allow incremental migration to a new codebase. It also excludes C#, since no JVM can run C# code. I think starting out with the Mono core would be better, both for interoperability with exisiting code and with Java, too (using IKVM). fejj: you got the SIGBUS because of an unaligned store: a pointer is stored to 0xa8c52 (aligned to 16 bits instead of 32). A backtrace would be useful to see where the data pointer is coming from, but I guess the mailing list is a better forum for bug reports than advogato:-). Anyway, in a couple of days I should be back on speed with my free software projects and my email backlog. The Perl compiler tools are very powerful: I wrote a backend to implement xgettext for perl programs (needless to say using regular expressions to pick strings is not going to work very well:-). I'll post it to CPAN for comments. Ok, after such a long time without a diary entry it's hard to come up with an excuse that's not lame, so I'll skip that part:-). Last events at my company have been quite interesting and enlightening: it looks like things are shaping up now and the future seems brighter. That same events allowed me (well, in the time between the various company meetings) to hack on a few little things and ideas. You can find it in the woody distribution. I used it to try to impress ettore and make him switch to Debian from that other distro: still no luck, but I'm confident and time is on my side ;-). First came GUADEC and then I decided to start porting Gtk to nano-X. Tomorrow I'll probably develop a small client-side window manager so that testgtk could be more throughtly tested. After that a rewrite of nano-X is needed (well, almost). Art and Brian from Linuxcare came visit us: Art gave me a 340MB IBM microdrive for use in the Cassiopeia and Brian a PCMCIA-CF. Meanwhile I got the cross-compiler running and downloaded the first program to the PDA (I was even able to write a buggy "hello world" kind of program, it printed "hello wolrd":-). Started writing a couple of slides for the GUADEC talk and polished a bit the Gnome::Designer toolbox (I stole the images from Glade, Gnumeric, Dia: it's too boring to paint all that little icons). Yesterday I got a Flash Card writer, so I was able to get a kernel and a loader on the Cassiopeia. Right now I'm using it through he serial console: need to write a keyboard emulator real quick:-).